What are the PPC Metrics? PPC auction systems Google Adwords, BingAds, Baidu PPC, Yahoo Search Marketing (Japan) and the 2nd tier PPC search engines can be quantified with a set of measurable PPC metrics. Let us look at the definitions for the major PPC metrics that are different from the official Google Analytics metrics. A Click is a user action when the user clicks on a PPC ad. A PPC ad showing up above all the organic search results will receive more clicks than a PPC ad appearing below the organic search results. Impression is the number of times your ad is displayed to the target audience. When your PPC ad is shown, an impression is counted. Impressions are measured differently for Google Instant. Cost is the actual advertising amount that you spend on your PPC campaigns or ad groups or ads or keywords. In PPC (pay-per-click) auction systems, cost is incurred when a user clicks on an advertiser’s ad. Click through rate (CTR) is the number of clicks your ad receives over the number of impressions within a specific period of time. In a real-time PPC auction, CTR is used as a factor to determine quality score and calculate ad rank. One of the major ad ranking factors in Google Adwords Quality Score is CTR. The higher the CTR, the higher the ad ranks. Maximum CPC bid is the highest bidding amount you set at the keyword level or ad group level for the keyword or ad that you are willing to pay for a click on your ad. PPC auction systems automatically reduce the bidding amount, so you are not charged for maximum CPC but actual CPC. Average cost-per-click is the cost of all clicks over the number of clicks received by your ad. Average CPC is different to maximum CPC. CPM means cost-per-thousand-impressions which is an advertising metric mostly used in display ad campaigns. Google used to only offer CPM as the pricing model for text ads running within Adwords content network. Impression share is a metric that represents the share of all impressions an ad acquired against other ads that are competing for the impressions. Google provides impression share data to advertisers through AdWords reports. The basic Google Analytics setup allows you to track and view your site’s PPC conversions in Google Analytics reports, provided in some cases you are required to manually tag your PPC URLs. How to set up Google Analytics to track your website’s conversions (as goals)? Add the Google Analytics Tracking Codes. Set up Google Analytics Goal Tracking. Conversion rate is the number of conversions through your ad over the number of times that your ad is clicked. Cost-per-action (CPA) measures the effectiveness of your ad based on actions taken by your site’s visitors. An action on a site can be defined as a purchase, sign-up, lead or pageview. 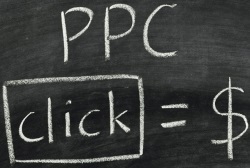 EPC is the amount your PPC advertising earns from each click. Profit refers to the dollar amount earned after taking cost into account or is revenue less cost. ROI measures how much profit you make from each marketing dollar you spend on your PPC ads. Quality score is a factor that determines your ad’s ranking in the PPC search ad auction systems. For example, Google Adwords Quality Score is calculated by factors including CTR of keywords, ads and PPC account.